I recently returned from a fantastic three day trip guiding two Canadian gentlemen, Mark Sadler and Bill Teed around the Somme and Arras. Based in Arras at the Hotel Les Trois Luppars, our time was very much Canadian themed but interwoven were many of the key actions of the British and French armies. 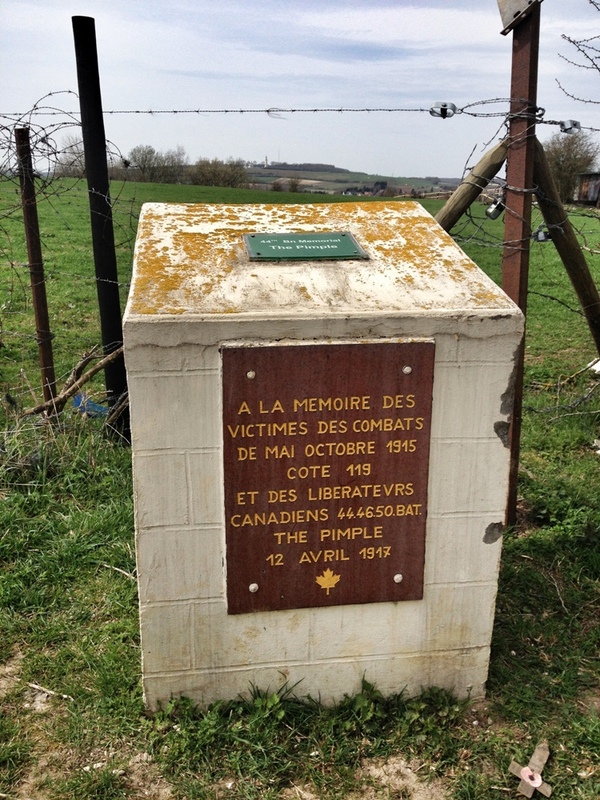 The first day was spent on a general tour of the Somme taking in many of the well-known battlefield sites. 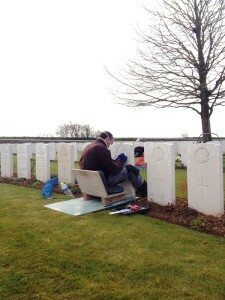 Day two was much more bespoke, following Bill Teed’s great uncle Cyrus Inches around the Somme. Cyrus, whose letters have been published as ‘Uncle Cy’s War: The First World War Letters of Major Cyrus F. Inches’ was an officer in the 1st Canadian Heavy Battery operating on the Somme from June to November 1916. Prior to leaving Bristol I had marked out his battery positions on trench maps and modern maps. This gave us an interesting afternoon following him as the battery moved forward with the British advance. Prior to 1 July his battery had been firing on the village of Fricourt and the small woods and copses nearby. With the fall of the village the battery moved forward, close to positions near Queen’s Nullah. Two subsequent moves saw the battery north-west of Montauban for two months and, finally, for two months from the end of September to end November 1916 to positions close to Longueval Road Cemetery. For Bill, these positions, taken in as we toured the Somme, offered a chance to see where Uncle Cyrus had been operating. Further stops included a visit to the Somme’s lesser known Caribou Memorial at Gueudecourt commemorating the actions of the Newfoundland Regiment in October 1916 and a stop at the grave of Henry Hutton Scott, son of Canon Scott, Senior Chaplain to the 1st Canadian Division at Bapaume Post Cemetery. Our final halt of the day was at Mouquet Farm, looking not at Australian and British actions there but the 1st Canadian Mounted Rifles attack on 15 September 1916. 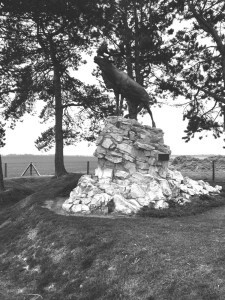 The third day was spent around Vimy and Arras area, an area synonymous with the Canadian Corps. 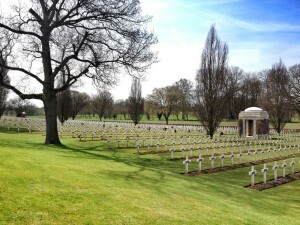 Cemeteries full of graves with the ubiquitous maple leaf are testament to huge Canadian efforts nearby in spring 1917. 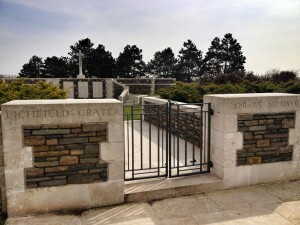 Stops included Cabaret-Rouge British Cemetery to look at the grave where the remains of the Canadian Unknown Warrior were exhumed from in 2000. These remains are now interred at the Canadian Tomb of the Unknown Soldier at the National War Memorial in Ottawa. It was good to see CWGC staff re-engraving headstones during our visit, part of the massive maintenance programme they undertake. 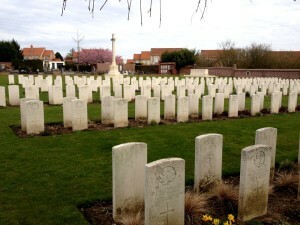 We then had a drive to a cemetery well off the beaten track which I had not visited before – Bruay Communal Cemetery Extension where we paid our respects at the grave of Lieutenant Hugh Mariner Teed, a great uncle of Bill’s. 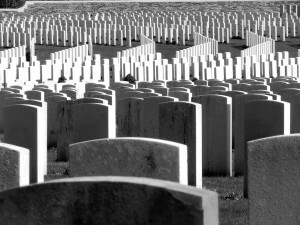 Our stop at Bruay was followed with a visit to Villers Station Cemetery, looking into the disastrous 1 March 1917 gas attack against Vimy Ridge. Many men who were killed that night, including Battalion commanders Lieutenant Colonel Beckett and Kemball are buried there. The story of the gas raid was hugely important to Mark Sadler whose relative, L/Cpl Robert Moffat, 11th Field Company, Canadian Engineers was killed that night. We paid our respects at the grave of Robert at the beautiful Ecoivres Military Cemetery close to Mont-St. Eloi. 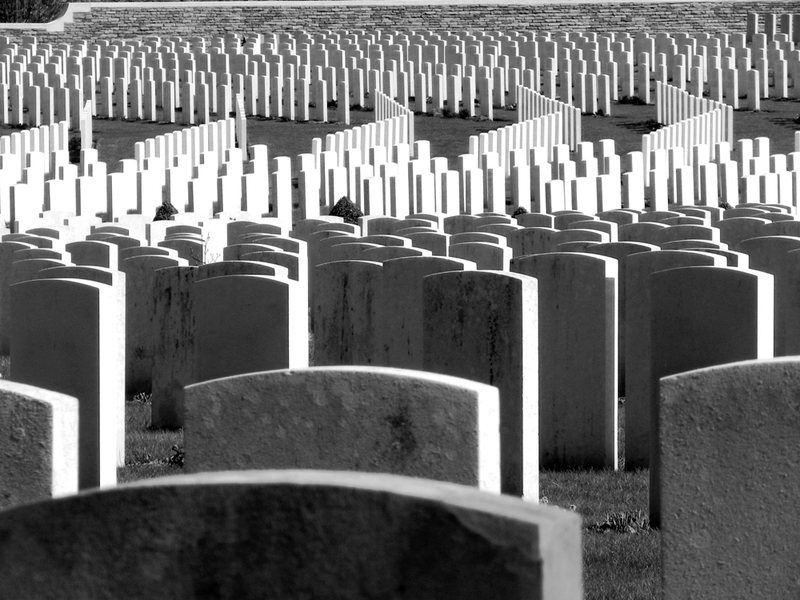 Rather unusually, there are over 750 French burials in the cemetery giving it a very special feel. After a visit to the Vimy Memorial we headed down to the rarely visited site of The Pimple and 44th Battalion memorial. All three of us enjoyed walking through the nearby wood and finding trenches and shell holes, testament to the destructive artillery bombardments on the ridge. Bill’s grandfather had witnessed the 9 April attack on Vimy Ridge, watching infantry from the Canadian 5th Brigade advancing. 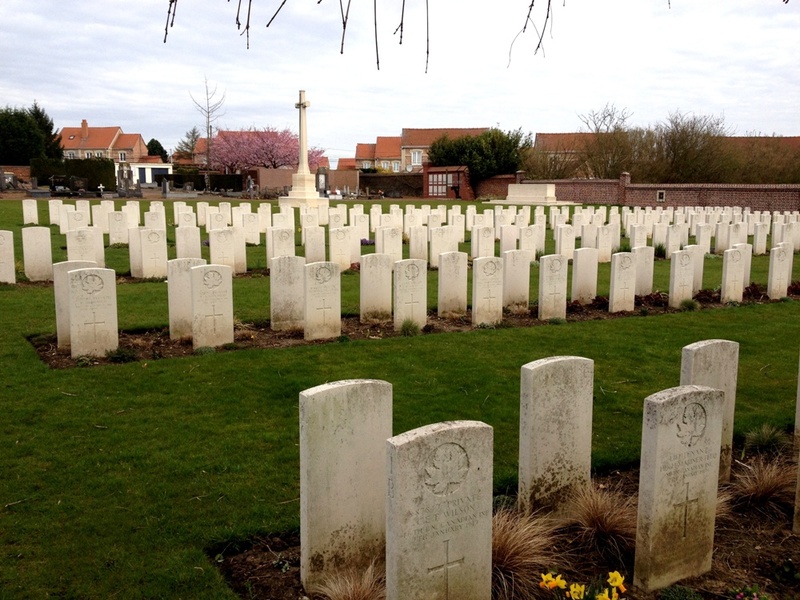 Standing on the slope next to Lichfield Crater Cemetery I read Bill’s grandfather’s letter describing the action. What made it unique was that I spoke with Bill’s mobile phone held up in front of me and my words reverberating around the breakfast table of the family back in Canada. The afternoon was spent in the British sector of the Arras battlefield astride the Scarpe. After stops at Fampoux, Roeux and Monchy we headed up Infantry Hill to look at the Newfoundland Regiment’s disastrous attack on the morning of 14 April 1917. Our final stop was Monchy British Cemetery visiting another of Bill’s relatives, Lieutenant Daniel Lionel Teed MC, 36th Battery, Canadian Field Artillery. 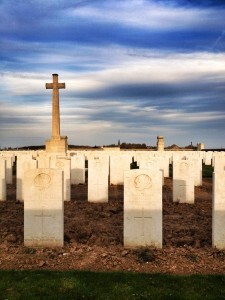 Daniel Teed, along with two NCOs had been killed at his battery position in Boiry Notre-Dame on 1 September 1918. We had looked down to Boiry from the Mound, the highest point of Infantry Hill and visualised the journey with his body and those of the NCOs back to the cemetery. Having devoted three days to Canadian endeavours on the Somme in 1916 and on Vimy Ridge in 1917 it seemed right to end our trip at Monchy, cleared by Canadian forces in late August 1918 at the start of their magnificent advance to Cambrai. With the cemetery bathed in evening sunlight I really could think of no finer place to be. My thanks to Mark and Bill for their companionship, genuine interest and terrific sense of humour. Until the next time…. 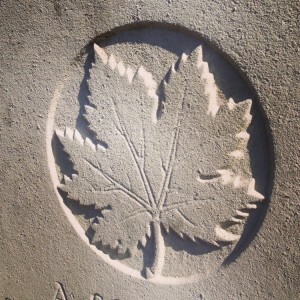 “My friend and I recently completed a remarkable and highly personalized tour of the Somme and Arras region with Jeremy Banning. Our first of many pleasant surprises was the discovery of the substantial preparatory research Jeremy had performed on several relatives who had served in the Canadian Army during the Great War. The accrued knowledge was slowly revealed, along with countless other facts (big and small), during our three day tour. Jeremy conducted our tour as a master storyteller. Far from reciting dry facts and pointing out sites from a moving vehicle, his modus operandi was to give instructions to the driver (me) and we would arrive at a site often not really knowing why we were there. Upon arrival at a cemetary, village, or a farmer’s field we disembarked from the car and were treated to a short discourse on what happened at that spot with additional poignant comments on who was involved. Jeremy’s mastery of the history always allowed him to frame the event or individual soldier within a larger context.